You all remember the Last March of the Ents by Bruce Lowell, Alyse & Remi Gagne, and Brandon Griffith, aka OneLUG. They recently displayed this at an event in Los Angeles (described by Ace on FBTB). 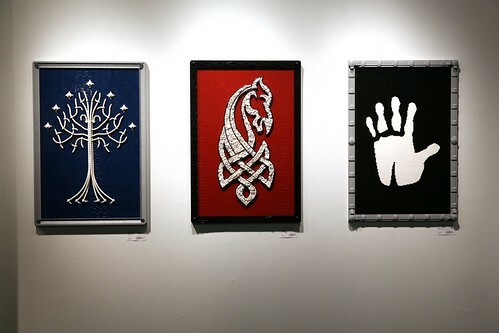 They also brought along some new work, mosaics of the emblems of Gondor, Rohan, and Saruman, by Brandon, Remi, and Bruce, respectively. Wow, nice find Bruce. These are all quite impressive. The White Tree of Gondor is perfectly done and Rohan's horse emblem is pretty well crafted, too. The Orc hand just doesn't seem right to me though, but I can't imagine the work they had to do to even make those angles so I'm not one to talk. Stunning work! Very impressive scale! Woah, this is amazing! I even doubted it was bricks at first sight. All of those are incredible, but if I had to pick a favorite it would be the horse. Brilliant work. Love the horse and tree designs. Wow, all those are pretty amazing. These guys are so talented. I agree with AK, the horse is awesome. The tree is also amazing and the colors really pop. The technique used on the horse is rather amazing. Wow, yeah, those are absolutely incredible! what's crazy is that none of hem look like lego, they look like actual paintings!